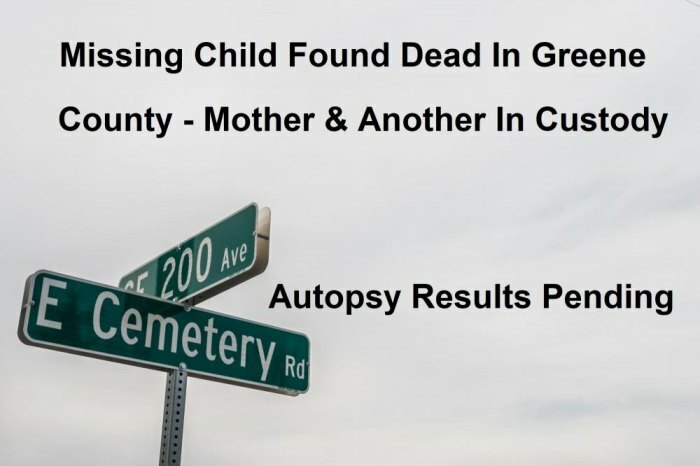 CARROLLTON - In an interview with Great Rivers Media, Greene County Sheriff Rob McMillen offered more details into the grisly discovery of a dead six-month-old boy in a shallow grave on a farm just outside the Carrollton City Limits. The child and his mother, who has been only identified as a 22-year-old Alton woman, were reported missing last Saturday to the Alton Police Department by the woman's mother, Sheriff McMillen said. McMillen told the reporter the mother of the woman contacted the Alton Police Department after having not seen the woman or her young child in “some time.” Family members of the woman and police soon discovered she had an “acquaintance” believed to be her boyfriend, who lived in Carrollton. The woman was said to have no permanent address and was routinely staying with others in what was described as "couch surfing". Carrollton Police conducted a wellness check at the address of the woman's male friend and discovered she was there. She reported to police she was fine. When police returned soon after that initial visit to check on the welfare of the infant, the woman was not there. Carrollton Police then notified the Alton Police Department she was not there and likely headed to Alton. Her male friend was then located by the Alton Police Department who interviewed him for “general information” regarding the case. He was released after that interview, as the police had no cause to hold him. The woman was believed to have returned to Alton, and was later located by the Alton Police Department. Sheriff McMillen said both the woman and her friend were interviewed again, and police were led to a wooded area east of the the railroad tracks from the Carrollton city limits on East Cemetery Road. A search warrant was issued by circuit court judge James Day very early in the morning to search the farm. McMillen said that even though the man gave permission for authorities to search the property, that because several people lived there, a search warrant was obtained. Alton Police and agents from the Illinois State Police (ISP) joined with the Greene County Sheriff's Office to conduct that search, and the missing six-month-old boy was discovered in a shallow grave on the property. Currently, the infant's death is being investigated as suspicious, Mark Doiron of the ISP said. McMillen told the reporter he was unsure at this time if the child's death was due to accidental or natural causes, or if it was a homicide. He said all cases involving a death such as this are investigated as homicides until evidence proves differently. The baby's body was sent to Springfield where an autopsy was performed. Charges are expected by Thursday afternoon as the woman and her friend have been held without formal charges since early Wednesday morning, and they can only be held for 48 hours without being formally charged. The responsibility of deciding what charges those may be lies on the Greene County State's Attorney's Office. Both suspects are currently being held on a 48 hour hold that is soon to expire and authorities believe charges may be filed quickly in the matter. Additional information will be forthcoming as the story develops.